This school diary is to be kept neat and brought to class DAILY. Summer Time: 8:30 A.M.-3:30 P.M.
Winter Time: 8:30 A.M.-2:50 P.M.
Summer Time: 3:45 P.M. – 4:40 P.M.
Winter Time: 3:05 P.M. – 3:55 P.M.
Our School’s Original crest was developed and built by Fr. James J. Dressman, S.J. and Fr. Ed Niesen, S.J. It represents the whole meaning of this Jesuit enterprise. The White X represents Xavier: The White X represents St. Francis Xavier who is the patron of our school. The Himalayas, Hills and the Tarai: The Himalayas supplying the water for the fertile fields of the Green Hills and the Tarai. It is also the countrys greatest resource carrying all the symbolism of fertility, both natural and intellectual. The Golden Color below represents the Tarai which is known as the Golden bowl of Nepal. The official seal of the Society of Jesus: It represents the worldwide religious organization operating the school. IHS is the monogram for Jesus and is placed inside the Jesuit Sun. Fountain and Lotus representing Godavari: Identified by the ever-flowing fountain of water sprouting up from the fish pond swimming pool in front of Xavier Hall, Godavari (First School of the Nepal Jesuit Society). It springs up out of a lotus with its symbolism of knowledge and purity. Lamp of Knowledge: Producing not just knowledge, but the wisdom to know how to use it. It also means that wisdom and knowledge gained in the school must be used to light up the lives of others. Live for God This phrase signifies ones relationship with God and the need to be connected to the Almighty. Our life is a gift from God and we must live in a way that it is pleasing to God. It calls each Xavierian to be spiritual in all that he/she does. Lead for Nepal This phrase signifies ones responsibility towards the nation and the call to be a true citizen of our great nation. Each Xavierian is expected to be a true citizen and lead the nation towards the welfare and growth of the nation. I will be brave/ in difficult times / and modest / when I am successful. / I will face adversity / with courage and dignity, / and meet success with humility. I will tell the truth / and act with honesty. / I will commit myself / to the truth / in thought, / word / and deed. I will accept people / who are different / and try to learn from them. / I will value / our unity in diversity. I will oppose discrimination / based on gender, / race,/ caste, / religion / and socio-economic status. I will always make / my own right decisions, / though my friends may disagree. / I will develop / the gift of freedom, / making my choices / with knowledge of alternatives / and consequences, / independent of peer pressure. I will always try my best / in studies, / sports / and activities. / I will aim at excellence, / not perfection, / in my studies / through practicing effective study methods / and consistently putting forth effort. I will be polite. / I will develop / personal and social habits / that promote the common good /and avoid all disrespect. I will be thankful / for my education. / I will always be grateful / for the gift of education, / using information and technology / with justice and care for others. I will care for the Earth, / and keep my school clean. / I will consider myself / a part of creation, / actively caring for the Earth / and promoting a healthy environment, / taking special responsibility / in caring for school grounds. I will always do the right thing / and be fair. / I will speak out / and stand up for justice, / evaluating the world around me / according to my formed conscience. I will thank God / and ask for Gods help. / I will build trust in my creator / through personal prayer. I will always be a Xavierian. / I will uphold / the honour of my school / by always living / according to its standards, / and I will always be prepared / to do a good turn. St. Xaviers School, Godavari is a school under the management of the Nepal Jesuit Society. Nepal Jesuit Society is the Nepal branch of the Society of Jesus, an international Catholic Religious Order. The Society of Jesus was founded in Europe by St. Ignatius of Loyola in 1540. Members of the Society of Jesus popularly known as the Jesuits, have been active in the field of education and other fields of service worldwide since its origin. Jesuit education is inspired by the vision of people drawn from the life and teachings of Jesus Christ, who has always been respected and admired for the last 2000 years. It is also based on the principles of character formation elaborated by the founder of the Society of Jesus, St. Ignatius of Loyola. This vision and these principles give Jesuit educational institutions a specific character and set before their staff, students and parents high ideals of humanism and service towards which they are invited continually to strive. Our objective is to promote the total development of the person so as to be trully human and trully Nepali. This means the students be open and committed to both the Divine Spirit and human beings, by being actively concerned about national development. Academics: Acquiring resolutely knowledge and skills of every kind. Wholesomeness: Growing holistically on totality of ones body, mind, heart and soul. Integrity: Increasing human virtues of peace, joy and forgiveness. Spirituality: Practicing ones faith and respecting the faith of the others. Justice: Opting for poor with a stand against unjust situations. Leadership: Committing themselves to be men and women for others. Excellence: Striving ever to do more and achieve greater things Magis (more). Collaboration: Helping to work in groups/teams with genuine fellowship. Renewals: Rejuvenating oneself always in true patriotic dedication. Commitment: Proving Men and Women of Competence, Conscience, and Compassionate Commitment. Our educational apostolate aims at accompanying persons to achieve fullness in life and integral development. Our education enables students to become effective agents of social change, and persons with and for others. A successful Xavierian is one who has distinguished himself/herself in the service of others. The school strives to achieve academic excellence as well as social excellence. Our aim is to provide an education that prepares students to live a meaningful life as well as one that will unite and equalize social and economic groups in society. a. Spiritual and moral objectives: The students shall show tolerance for the religious conviction of others and respect the rights and dignity of others. b. Intellectual objectives: The students shall systematically develop their powers of observation, imagination, thinking, reasoning, understanding, communicating, interacting, affirming habits, attitudes and values. c. Social and civic objectives: The students shall acquire knowledge and appreciation of Nepali culture and shall become active agents of change for the purpose of bringing about a better and just society. d. Aesthetic objectives: The students shall develop an appreciation for the beauty of God reflected in the Universe through arts and other means of creative expression that enrich the quality of human life. e. Physical and mental health objectives: The student shall develop physical fitness, emotional health, maturity and a wholesome personality. 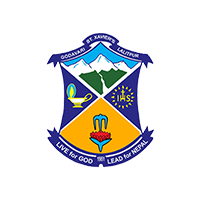 In academics, the school follows the curriculum prescribed by the Education Department of the Government of Nepal. The school focuses on programmes and activities which will help the students to grow in different areas; physical, intellectual, spiritual and psychological. Thus, games are compulsory at SXG, and other extracurricular activities are highly emphasized. Even though both English and Nepali are taught here and emphasized, the language of the school is ENGLISH. The school rule for students is to speak good/correct English at all times inside the school compound, in the bus and at school bus stops. During class time, answers and comments made by students should be given in complete, correctly phrased English sentences. Value education for the non-Christians and catechism for the Christians is compulsory in the school. The years the students spend in the school should enable them to acquire sound principles of conduct and action as well as lay a solid foundation of true and purposeful living when they attain adulthood. Principles of honesty, trust, cooperation, self-reliance, and hard work are inculcated through various activities. In these activities students learn to think for themselves under the steady supervision of moderators. With activities, students are given the opportunity to see practical applications of abstract ideas like give and take that they learn in the classroom.